We’ve heard about pet water fountains for the longest time and finally decided to take the plunge. Having 2 fur kids (our dog, Harley and cat, Lilo), catering to their eating and drinking needs daily can be worrisome. Are they eating well? Are they drinking enough? After having ours for 1.5 years, I’m so glad to say we’ll never look back and we definitely don’t regret purchasing them. These are good not just for convenience, but more importantly, to help keep the water fresh and healthy for your pet. Here is a look at our cat water fountain reviews and top cat (or dog) water fountains that can provide healthy water for your pet. 1. Drinkwell Ceramic Avalon – Awesome Cat Drinking Fountain! What is a pet fountain? How much water does a fountain hold? Benefits: Why Should You Get One? Is it necessary to have separate water fountains for my different pets? How can I help my pet adjust to its new pet fountain? My pet used to drink eagerly from the fountain, but has recently been reluctant to drink, What happened? Featuring free falling stream, the Drinkwell Multi-Level Lotus water fountain is popular in households with one than one cat or dog. I had to add it into this Best Pet Fountain list! Its dimension is 11.6 x 11.6 x 8.4 inches, weighing almost 4.6 pounds. It is made of ceramic which is why it must be handled with caution. Providing fresh drinking water, it helps to maintain their health in good condition. The elevated portion of this pet water fountain is also helpful for dogs/cats that cannot bend and drink. The flow of stream can also be controlled depending on necessity. The charcoal filter removes dust and the debris from the water while the motor moves with very low power consumption. Debris are removed while the stream falls. This aerates it with more fresh oxygen. All the parts can be very easily opened and cleaned. Stain marks can be removed with dishwasher but the charcoal filters need to changed periodically to make it effective. Dual free falling streams adds oxygen to the h20. Most other brands just have one main stream. Ceramic design is actually known to be more hygienic. This Drinkwell stainless steel 360 fountain has replaceable charcoal activated filters. They help to remove bad odors, giving the water a fresher taste and smell. This is useful for households with multiple animals. Giving a 360 degree access, it can hold as much as 128oz. The premium stainless steel texture makes it fit with your interior design. It’s easy to clean up, making it even more convenient to use. This no-leak fountain with multiple changeable plastic spout heads makes it very useful for multiple pets. The free falling stream over the five spout rings makes it easier for at least three animals to drink at once. As the motor is plugged, the fresh stream circulates through the charcoal filters. This removes impurities and odors. It gets collected over the stainless steel cat water fountain bowl. Moving streams help to attract your pets and encourage them to drink more, keeping them hydrated. This fountain looks like a raindrop and can complement your interior design. The circulating stream flows over the ceramic material, preventing any growth of bacteria. 60 oz capacity – This is also an awesome water fountain for cats! This Pioneer Raindrop dishwasher safe ceramic product must be handled carefully as it’s fragile. it is added with some plugs which gives added convenience for using. Above all, the circulating stream keeps it fresh. Clean this water fountain regularly, specially if you are using the black ceramic one. The parts are safe to be washed in dishwasher. The filter should be replaced in time to avoid any impurities. Handle with care since it’s made of ceramic! This fountain from Drinkwell Multi Tier is helpful for those who have more than one cat or dog at home. It has a useful and unique design with two stairs. Its 100 oz capacity means you don’t have to refill as often and the elevated drinking dish helps older animals or pets with arthritis. This has a charcoal filter which can be easily replaced as and when required. The free falling stream has more freshness and oxygen, which makes it healthier than stagnant sources. When attached to power, the charcoal filter clears all bad tastes and odors. This makes it tastier and healthier than any other stale water. With low voltage submersible pumps, this product is great for being noiseless. The water produced is fresh and has more oxygen than stagnant sources. It can be very easily cleaned in the dishwasher. All the parts except the filter are washable in the dishwasher. The filter, which collects the debris, should be changed periodically. Great water fountain for cats and canines! This pet fountain provides fresh, healthy and purified . The elevated fountain allows your pet to adopt a comfortable drinking position. It is able to hold as much as 200 fluid ounces. If you have large dogs and need a large dog water fountain, check out this Hagen Dogit version for large dogs here. Fitted with a 360-degree rotational motor, this product is great for big sized dogs and even felines. It has a capacity of almost 200 fl.oz and helps to provide healthy and purified h20. It comes with an integrated splash guard which prevents spilling over the ground. My Dogit review is here. This best large dog water fountain circulates the stream and passes it through the charcoal filters. Its filter removes the dust and debris along with the odour and makes it flow. This energy efficient unit is great for pets who love the elevated basin feature. The parts of the products are easily disassembled. The bowl and the splash guard must be cleaned properly if you want to keep it stain free. Also, the filter is replaceable. This ceramic water fountain is stylish and complements any interior decor. Weighing about 4 pounds, this is easily one of the most stylish options available on the market. The free-falling stream with adjustable height is very helpful for sick and old pets. More than anything, it provides tasty and healthy h20 free from bad odour with the help of its charcoal filters. No batteries needed – easy peasy! The charcoal filters clean the stream and make it free of debris and big dust particles. Since it’s a heavy ceramic product, it needs to be handled carefully. Any stains can be removed if it is cleaned regularly. The charcoal filters are not safe for dishwashers but the rest of the parts are. If you want a quiet cat water fountain, this is a great choice! Perfect for households with multiple cats and dogs, Drinkwell 360 fountain helps provide fresh, oxygenated water. It features an impressive capacity of 1 gallon which is enough to feed multiple pets. The charcoal filter removes any bad odor and collects big particles. Fitted with the multiple spout rings, it is recommended for those who have more than one pet at home. The charcoal filter traps dust and other unwanted particles. It also removes any bad odours. It only uses low voltage, circulating the stream through the filter. Through the spot heads, the stream falls freely and adds to the freshness of the water. All the parts of the product can be easily dismantled. Regular cleaning is necessary to keep it odour and stain free. The charcoal filters help to trap dust and debris. The parts of this awesome cat fountain can be used in dishwashers except for the filters. The Aspen water fountain has an included reservoir which makes it even more useful. The filters can be replaced as and when required. The pump provided with the product easily fits into an AC wall adapter. Choose from 50 oz, medium or 3.8 pounds. Read my Aspen review here. Featuring a free-falling stream, this product is loved by those who have more than one pet. The free-falling stream means the water is filled up with more oxygen. This also adds to its freshness as compared to stagnant stores of water. The fountain has a charcoal filter which is used for removing the debris and the big particles. The bad taste and the smell are also eliminated. As soon as it is plugged in, the charcoal filter circulates the water and makes it tastier and healthier to drink for your pets. Made of plastic which is easy to handle, fuss-free, easy to clean yet looks great! This water fountain does a good job by attracting pets towards its stream. The sleek and elegant texture of the product complements any household interior. This fountain has a capacity of 60oz. With its continuous flow, the bowl remains clean. Also, with the replaceable charcoal filter, the cleanliness and purity is maintained. It is fitted with an electric pump with low power voltage which makes it safe to use. It also has a 1.82m long power cord. The premium stainless steel look makes it look elegant and posh in any interior. As the name suggests, this is designed to look like a raindrop. The stream cascades down towards the inclined part in the bowl after it bubbles up. Water is constantly circulated for ultimate freshness! It’s easy to clean. Simply unplug the motor, wash the bowl with dishwasher, and change the filter regularly. You may use a little vinegar for quick drying. Make sure you stack the parts sequentially. Reassemble the parts after cleaning and drying. Repeat the procedure regularly. This water fountain deserves a mention on our list. It’s also got five stars from customers and high ratings. The Drinkwell Platinum 168oz will keep your fur kid healthy and hydrated by making them drink more. This modern designed fountain gives a free-falling stream of oxygen-aerated h20 which is essential for a healthy pet. The taste also gets better with the carbon activated filter. Fitted with a submersible pump, the product works noiselessly. Also, the low voltage operation makes it safe for the use of pets. With a capacity of 168oz, it has simple features which makes it user friendly. The unit does not need to be connected to any pipeline. The submersible pump works silently traps bigger particles. The flow level is adjustable. This product is absolutely dishwasher safe and should be cleaned regularly. The charcoal filter must also be changed periodically as it collects all the debris. A pet fountain is a way to provide clean, circulating water to your pets. A traditional water bowl isn’t great for drinking, even if you change the water regularly. Dust, food particles and dog hair all end up in it to make the water less than appealing. The water in the bowl is also stagnant, which in nature is often a sign of water to stay away from. This means it is less likely your pet will drink from it. Water fountains come in a variety of designs and levels of complexity. But in essence they are made up of a basin and a top, with a water pump that pushes water from the first to the latter. The water then falls back down to the basin, and the mechanism repeats. This creates a continuing flow that will ensure the water stays fresh. Fountains also come with filters to catch everything that ends up in the water so that it stays pure. Generally, the velocity of the flow can be adjusted to suit your pet’s specific needs or preferences. Some water fountains make soft gurgling noises. 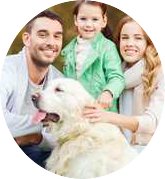 Others are completely silent, so there is a wide range of choices for pet owners. This is an important factor to consider when buying a pet fountain. There are many different sizes available. An average sized fountain will contain about 70 ounces of water and some bigger fountains will easily go up to 160 ounces. If you have multiple pets, getting a big fountain can be an efficient solution for their drinking needs. However, the fountain does not replenish itself. Regardless of size, you are going to need to check the water supply frequently and make sure there’s plenty of water for your pets. Regardless of which one you use, it is essential to know how to maintain them well. Here is a look at a few tips that can help you maintain it for years to come. You do need to fill up with fresh h20 every day or alternate days and clean the parts thoroughly. You also need to change the filters periodically. Even so, this is an investment that’s definitely worth the health of your fur kid. A fountain gives your cat or dog the benefit of clean drinking water throughout the day. My cat Lilo hates drinking. We all love our pets and only want to give them the best quality food that we possible can. So why shouldn’t we do the same for liquid intake? Every owner can attest to the fascination that felines and dogs have with dripping taps. One of the reasons behind this might be the built-in drive of these animals that prefer running water sources over stagnant ones. The built-in filtering system makes it perfect for those of us leading busy lives. With some models, the reservoir is big enough to supply fresh water for a few days if you are going on a short vacation. These use a small submersible tank that circulates the stream from the bowl to the tank and back again. During this process, it passes through a charcoal filter to make sure all impurities have been removed. It helps with convenience. You won’t have to replace the water daily as it has a filter or some models come with big reservoirs to provide your animals with a larger supply. It even helps to keep the air in your home clean and fresh! When choosing a water fountain for your pet, there are many things to consider. An important factor is the material the fountains are made of, as each comes with its pros and cons. These are the most common type and carry a series of immediate benefits. They are generally the cheapest options. Their light weight makes them easy to carry and move around and they are harder to break. However, cats and dogs can scratch the plastic with teeth and claws. This creates dents in the material where bacteria can hide and breed, thwarting your efforts at keeping your pets’ water supply clean. If you get a plastic fountain, check it regularly to make sure it’s still intact, and smooth out any scratches or replace it when it gets too battered. Also be sure to buy a water fountain made from BPA, BPS, and phthalate-free plastic. Toxic chemicals in some plastics can leak into the water supply and be harmful to your pets. Stainless steel pet fountains are good alternatives to plastic as they are safe from any toxic chemical leakage that may harm pets. They are also impossible to scratch so your pet is protected from the bacteria proliferation risks of plastic fountains. Steel will last for a long time and thus can be a good investment for the future. However, it’s important to be mindful of price range with steel options, as the cheaper fountains may rust over time and need replacing. Out of the different types of materials for fountains, this is definitely more on the pricey side. Ceramic fountains are decorative additions to any room. They come in a variety of designs that give a touch of class to what is an otherwise quite mundane (and sometimes messy) activity. Ceramic also resists the acidity of water, so these fountains are sure to last a long time. The only drawback is they can be a bit heavy and also fragile, so make sure you put them out of harm’s way if you want to preserve them from breakage. It’s important for animals to have separate food bowls, toys and even litter boxes as they can be quite territorial with their belongings. When it comes to water, animals often don’t mind sharing. In the wild they would all come to the same river, for example. Make sure you buy a larger water fountain to supply for more pets. Place it away from litter boxes and food bowls to prevent any contamination of bacteria. Animals don’t enjoy sudden changes to their environments. Especially for important aspects like their water supply. The rapid movement or gurgling sounds of the fountains can seem threatening. Or simply strange to some animals, which will dissuade them from drinking. It’s going to take some time for your pet to feel safe and comfortable with its new fountain, so be patient during the process. You might initially try shutting down the pump so that the water is still like in a traditional water bowl. Then progress to turning the pump on once your pet has adapted to drinking from it. There might be a few different issues at play here. It is possible that your fountain isn’t working properly anymore. Pets are very sensitive to the presence of contaminants in their water. So they won’t drink if there’s food, dust, hair or other debris in their fountain. Of course, if there are, it means something isn’t working as it should. The filter might need to be cleaned or perhaps even the entire pump mechanism. Our pets need an ample supply of fresh and clean water, and sometimes we as owners overlook this. By using one of these dog or quiet cat water fountains, we can ensure that they get their share of healthy, fresh h20. Hope our dog and cat water fountain reviews have helped! There are many kinds of water fountains with a filter. They can make the water fresh and pure for your cat or your dog. The important thing that you should do is to change water filtering cartridge within time. I have the second fountain, the Pioneer Pet Stainless Steel Fountain Raindrop Design and it’s hands down one of the best drinking fountains for cats. I adopted a stray cat a few years back and she turned out to be very picky about anything; her food, her water, everything has to be in a squeaky clean bowl otherwise she won’t touch them. Cleaning the filter is not as simple as I wanted but she has fresh water at her disposal, regardless if I’m home or not, so I’m gonna live with it.